Dimensions: 4' x 1-1/2" x 1/2"
Dimensions: 3' x 1-1/2" x 1/2"
Dimensions: 6' x 1-1/2" x 1/2"
Dimensions: 8' x 1-1/2" x 1/2"
Dimensions: 12' x 1-1/2" x 1/2"
Merchandising bars has a rectangle design with ½” depth and 1.5” tall in Mirror Polished Chrome. The width of merchandising bars will vary from 3 – 12 feet wide. These bars can be placed in between Snap on Brackets which cling to the tip of Heavy Duty Brackets and allows the bar to be flexible in where it can be placed. Heavy duty brackets are necessary because they are heavier so they can hold the weight of the bar, faceouts, waterfalls, and hooks and any other attachment you choose to tack on. 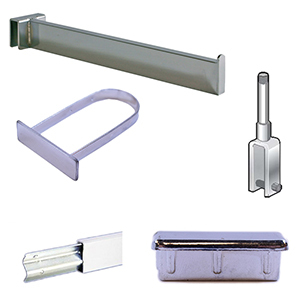 Find Slatwall and Gridwall Brackets to hang the bars onto those wall systems. Merchandising Bars are just one of many bars you can find at American Retail Supply as we try to provide you with as many options and variety as possible. Call if you need help choosing and understanding how they all fit together 1-800-426-5708.